Female imagery abounds at the Goddess of Fertility temple. Right next door to the Koxinga Shrine is the Lady Linshui Temple (also called Madame Linshuei Temple, or Lady of Linshui Ma Temple). This is a largely feminine temple that focuses on the cult of Lady Linshui, the Goddess of Birth and Fertility. 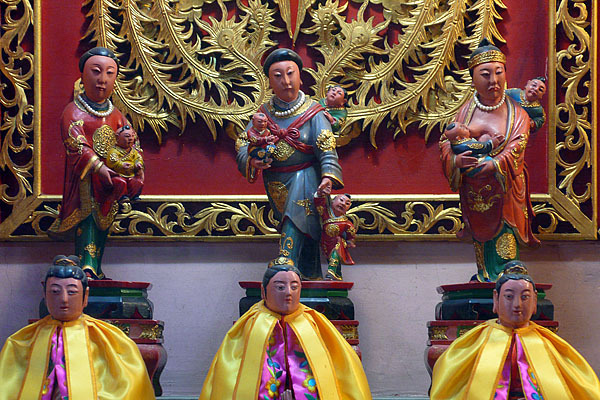 While many temples around Tainan feature the goddess idols of Guanyin and Matsu, no other temple has as many female idols or depictions of women as the Lady of Linshui Temple. Lady Linshui Temple dates from 1736. Lady Linshui is a deity born from the legend of a woman named Chen Jinggu. This was a woman of the early AD700’s who was said to be the daughter (or avatar) of the goddess Guanyin. Chen Jinggu was a prodigy child who could speak shortly after birth and write shortly after learning to walk. She had a very storied life, but to make a long story short, she was a rain shaman who battled snake demons and then became a master of childbearing practices after her death. Legends abound about her life and she is well represented in popular film and fiction. The Lady of Linshui cult developed in the late 700’s in northern Fujian Province and came to Taiwan with Fujianese migrants. Lady Linshui is believed to be the protector of women and children, or more specifically, fetuses and infants. Women who are pregnant, wish to be pregnant, or have recently given birth often make their way to this temple. 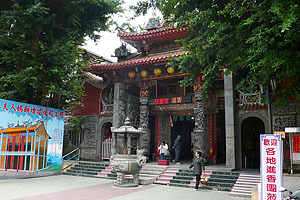 Women also come to the temple to pray for male offspring, or even to have a Taoist priest perform a ritual to change the gender of an unborn child (probably from female to male). Additionally, people will come to this temple if their baby is crying too much in hopes that they can eradicate whatever is afflicting the child. 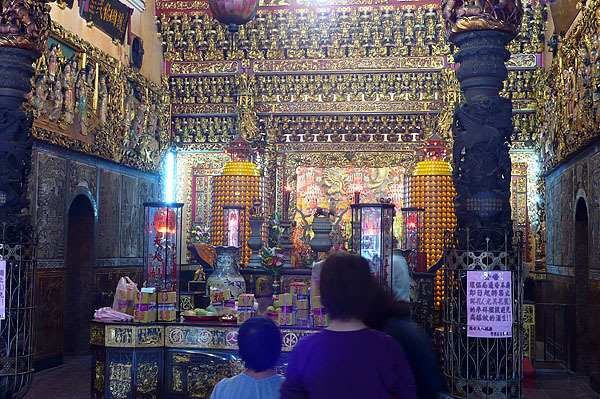 Tainan’s Lady Linshui Temple and the Baihe Lady Linshui Temple in Tainan County are among oldest and most important Linshui temples in Taiwan, and many people make pilgrimages to them. 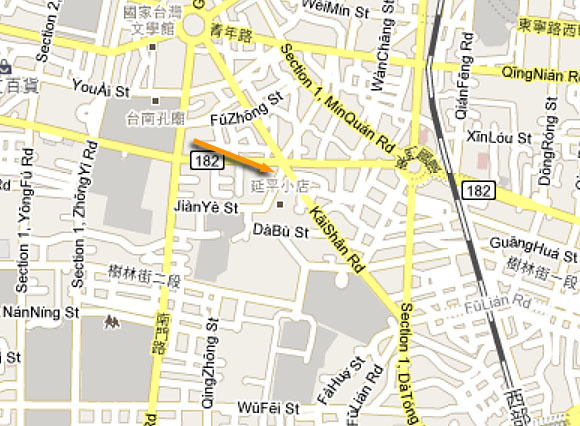 The one in Tainan was originally built in 1736 as a straw hut, and then added to in 1852. It was rebuilt in more solid form in 1886 and renovated to its current appearance in 1983. There are many representations of women inside the temple. 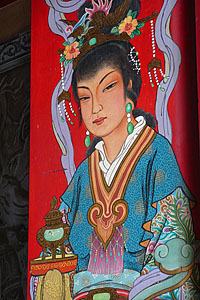 Lady Linshui is represented as a member of the Three Ladies (Sannu Jiao), and she is also supported by 36 assistants. There’s three assistants for each month of the year, and they are displayed by month in glass boxes along the sides of the hall. Many of the murals and relief sculptures also depict female imagery and symbols. There are also two exquisite paintings of female door gods. Women praying in the main hall of Lady Linshui Temple.